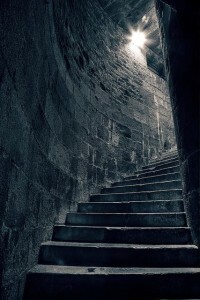 The lantern’s light bounced and swayed as he walked down the stone stairway. At the bottom of the stairs, the dirt floor muffled the sounds of his footfalls as he walked to the center of the room and the raised altar. He reached into the inner pockets of his black robe and pulled out a lighter. After several flicks of the steel against the flint without a single spark he put it back into his pocket. Wainright drooped. If the light had been on him still, he would have seen the boy’s shoulders fall and his head hang low. Instead he turned to the altar and lit the candles on the tiers up and down the back. Wainright stumbled up the stairs in the dark. When the boy had gone he sifted through a few papers on his work bench off to the side of the altar. And then he began to move the various papers around the table as he searched for his sanctificial knife. It was nowhere to be found. “Wainright, where is my knife?” He did not yell, but the words had a hard edge to them and they carried all the way upstairs again. After a few minutes he heard the scuffle of Wainright’s feet on the stairs. The boy scuffled and rustled down the stairs and stumbled in the dark toward the candle lit altar. He never saw his master, dressed in black robes till after he felt him, felt the knife slip through the robes and through the flesh. He felt his master fall to the floor. “That will be all,” Wainright said.